Please listen carefully - for I am afraid that you might miss this book. It will be of great help to your kid, but maybe probably an even greater help to you, my dear reader (parent/teacher). More than a year has passed since this book arrived at our home. It is waiting on the shelf, until my twins mature. It is written for kids aged between 8-12, although I am certain that it can be used successfully with kids a bit younger and older than that age range. I knew when I was ordering it that it was one of the most important books of our collection. It may not be a masterpiece, but it is revolutionary. This is a book that will open my mind to what is in their hearts. Although I have a great relationship with my boy and girl, I also know that I will not really be able to know what my twins are thinking about many important choices in life. How should a parent approach many complex issues? Well, the first thing to ask yourself is do we as parents really know what is the real issue that is bugging our kids. What is the obstacle that is keeping them down? We need to keep opening doors, because life has a way of closing some of them for our boys and girls. So, let us chose to open the doors with books. Some read-aloud books are for pleasure, while others are for diversion and for other purposes. As a parent I do not want books merely to serve as literacy tools. Literacy is important, of course. But as our kids grow - it is important to show them that books can also help to fill their other needs, wants and even voids in life. How can you as a parent be sure that you will tackle the very moral issues that will face your kids in life? 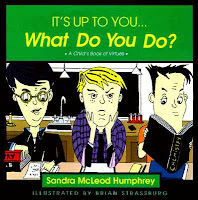 Well, as author Sandra McLeod Humphrey explains - "it is never too early to begin talking with our children about values and to help them define and develop their code of moral conduct". 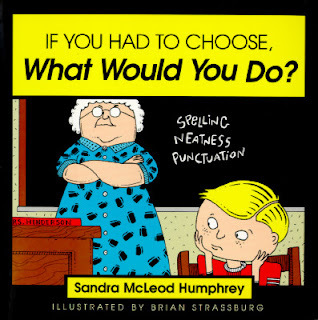 I love the idea of her book If You Had to Choose, What Would You Do? as it provides 25 separate stories that can be read aloud and then analyzed together - as each of the stories is followed by a handful of open-ended ethical questions. Is it wrong to cheat on a test if everybody else is doing it? Does it really matter how you win? Should you return the money to your race sponsors, if you are unable to finish the race? What should you do if you saw someone who lost money on the street and your best friend insists that you keep it? If your sister makes you promise not to tell that she's doing something wrong, should you tell your parents? When your best friends are fighting, should you pick sides? 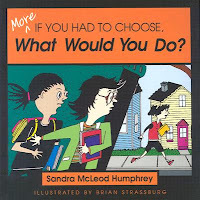 If You Had to Choose, What Would You Do?, which was written by a licensed and award-winning psychologist, is an excellent resource that will provide a great opportunity for bonding during read-aloud time. This book is a great vehicle that facilitates adult-child communication and it will you allow to expand the ideas that are explored in the stories (each story is three-pages long) to easily include examples of dilemmas that could currently be preoccupying your own child. What I specifically love about the book is that it does not recommend "correct answers" to the moral and ethical issues that are expounded in the stories. In fact, the process of exploring all facets of the ethical dilemmas is more important than a mere true/false response to the questions raised. Although it may seem that my goal with these books is to learn what my kids think about complex moral issues that (will) face them - in fact my real motivation as a parent is to help them to consider these issues in the comfort and security of their armchair before such issues spiral out of control in real life (as they sometimes do). Hot Issues, Cool Choices: Facing Bullies, Peer Pressure, Popularity, and Put-downs. Isn't it fabulous that by reading aloud we can forge a closer relationship and also help our kids develop empathic critical thinking skills? Reading aloud is a magical portal that will allow us to get in touch with the important stuff in the lives of our kids. So, let's all think ahead and let's get ready to guide our kids through everyday problems by .. reading aloud. Oh, thank you so much for this mention. I'm always looking for secular children's books that teach morals and ethics. So far, I have...the old OOP ValueTales, which are fab, but it's nice to have a starting place for more! I am so glad that you enjoyed it. It is indeed a great book to teach kids morals and ethics in a "hands on" sort of way - yet still indirectly and without the 'preachiness' that can turn off kids sometimes. Thanks for reminding me about the ValueTales set, I completely forgot about it! Many thanks for taking the time to leave a comment! out of control in real life (as they sometimes do)"
is SO relevant and SO important. There are so many different influences and emotions flowing through a REAL LIFE situation that it is nearly impossible, especially as a child, to think through a situation completely and rationally. I believe we are all baptized by fire when it comes to making moral and ethical decisions in life - we make them and then, later mull over our actions and wonder, "What will I do next time?" How wonderful it could be that this FIRST ENCOUNTER with these difficult decisions could happen, as you put it, "in the comfort and security of their armchair," and in the safe presence of family and open discussion! KUDOS for another fantastic find! Often, when I surf on the net - I find blogs with interesting posts, but then I am often also bowled over by several great comments that follow. Your comments on ReadAloudDad.com contribute so much to the quality of the discussion and they often help to flash a light straight on heart of the matter! I love your words. They echo my feelings exactly. "I believe we are all baptized by fire when it comes to making moral and ethical decisions in life - we make them and then, later mull over our actions and wonder, "What will I do next time?"" Indeed. Baptism by fire is a thing that we can avoid sometimes, which could help our kids to make the difficult decisions much easier. I am so happy that we have your books in our home library! They are nothing less than life-changers. My message to parents is that building relationships is as important as building literacy. Reading aloud is much more than story time - it is a time to bond. I truly love your books and I think that you had a stroke of genius when you thought of the concept behind them. I will certainly revisit your books once my kids are old enough for us to read them together. Some books are just too good to wait, so I had to share them with my readers. Dare to Dream Big! is also incredibly inspirational for kids! Thanks for all the great work that you are doing for our kids! WOW--thank you so much! You really get what I'm trying to do and I really appreciate that. If you ever have time to post a review on Amazon, that would be wonderful! Thanks again so much and if you ever want autographed copies of any of my books for a book giveaway, just let me know. Thanks Again! Popping over from WUHS to say thank you for this resource! I just put it on hold at our local library and am looking forward to going through it with our two boys. It warms my heart to know that a book tip can help another parent or family to enjoy some great children's literature. I do hope that you enjoy the book with your two boys and I would LOVE to know how did it go. My kids are still 4 years old, so I'd really love to hear your experience! I am really happy your library has a copy. Cool!